Automatic security lighting can provide additional safety and convenience for your home, farm or business. You can protect your home and property for little money. 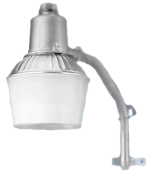 A 100-watt high-pressure sodium light is only $7.28 per month plus taxes and applicable adjustments. There is a one-time connection fee of $25. Other security light models also are available. First Electric personnel will replace bulbs and maintain the light at no additional cost. The automatic eye tells the light to come on at dusk and to go off at dawn. To have a security light installed, call 800-489-7405 or click here.